To cut a long story short, I was accidentally thrown into retirement in my early fifties, and I was none too happy about that. Now it’s been ten years since my last “real” – i.e. ‘paid good money’ – job. It’s six years since I started blogging. What a transformation in that time! Perhaps I shouldn’t continue to call this blog The Reluctant Retiree. On the other hand, if I changed now, I might start to feel that I have mastered retirement. And I don’t think there is any such thing. The road to re-invention is a continuous path – at least that is my experience. So here you will find my day to day stories – some documenting exhilarating adventures, others simply philosophical musings. Perhaps those of you who are also in your second adulthood – the one that comes after kids and career – may identify with my journey to re-invent the rest of my life. Studying at university for the first time, graduating in July 2012, aged fifty-seven, with a Masters of Electronic Commerce (which does not a WordPress expert make). Publication of my memoir I Belong to No One. Published by Hachette Australia in June 2015; Orion UK in December 2015 and Bolinda Audio in August 2016, narrated by me. Available worldwide in trade and mass Paperback, Kindle, eBook, CD and MP3. MY MEMOIR. A volunteer role as Co-Host of The Good Life, Australia’s first dedicated YouTube channel for over 55s TV CO-HOST. When all one’s effort to find another permanent job comes to nought, then there is nothing for it but to spend the kid’s inheritance on overseas travel, right? Read the Travel Stories of an Aussie Abroad, starting with “Random Thoughts While Locked in a Tin Can” under TRAVEL ELSEWHERE – click on the drop-down menu to choose a country of interest. Retirement means being able to jump in the car and hit the road whenever we like, or tick off those bucket list trips such as the Indian Pacific or Ghan train journeys. It’s all there under AUSTRALIAN TRAVEL. What started as a daily writing exercise has turned into a gripping, yet-to-be completed serial story of what happens when a bored housewife meets a Dostoevsky-quoting builder . . . meet Liz Thurlow under FICTION STORIES. One of the great things about retirement is having the time to exercise an enquiring mind and indulge in passions; in my case, family, history, research, and flying boats. Okay, that last one doesn’t occupy my every waking moment, but I do have a ‘thing’ for Catalinas. 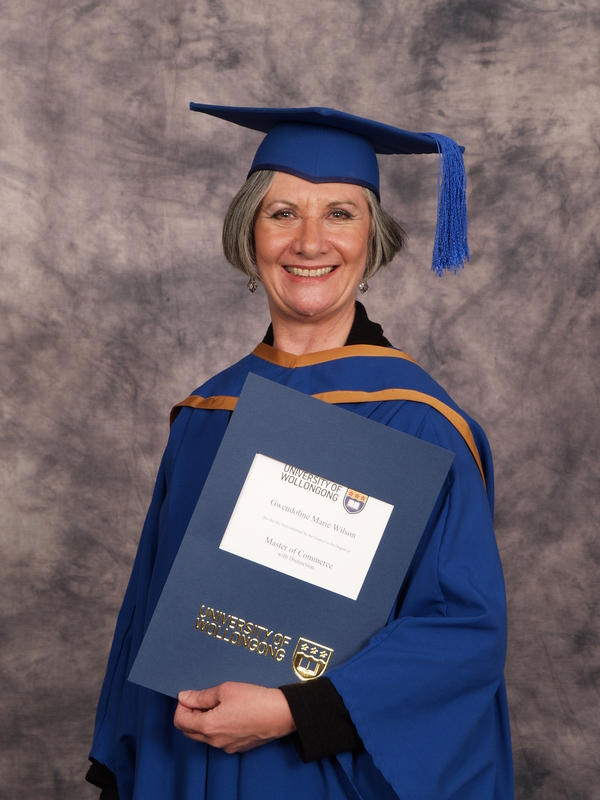 So that’s me, author, blogger, presenter, traveller, amateur historian, philosopher, wife, grandmother, oh, and mature-aged uni graduate , with the photo to prove it . . .
For more information on I Belong to No One, please visit my website at www.gwenwilson.com.au Goodreads and Amazon reviews are always welcome! Hi Gwen – sending you holiday wishes from Berlin – maybe that’s brrrrrrrrrrrrrrrrrrrrlin!!!! It’s getting a bit nippy here! It’s turned hot and humid with many summer thunderstorms over here 🙂 I hope you have a wonderful holiday season – you’re definitely in the right place for the Christmas markets. Hope you don’t get lonely on the 25th though. Many thanks Paul, and my apologies for the delay in response. As it happens, I have been engrossed in finishing and editing my latest manuscript – or at least the third draft. It’s printing as I type! Fingers crossed my agent gives it a tick of approval. I have so many posts still to write about our amazing trip to Canada last June. We loved your beautiful country. And I see you spent a year in China? Wow! We had one month as tourists and were amazed by the experience. Very inspiring! I look forward to seeing your travels! Best wishes for a full, lively, and heathy 2018 Gwen. Thank you Richard, and the very same to you. Grandkids have just gone home after a four night stay. We managed a trip to the cinema – Jumanji! Haha! Not my first choice, but I actually enjoyed it. I saw the original Jumanji when my kids were kids; am tempted to take myself, I’m sure I’d enjoy it too. Mine said it was quite a different premise from the first. This one is set within the game. I found it amusing and well-paced. And Jack Black as Bethany was an interesting approach! Some of the lines were very clever, and there were subtle stabs at other films. For example when the character of Ruby Roundhouse remarks that her Laura-Croft-style outfit is totally unsuitable for the jungle. Go along and abandon reality for a while! ah no. I’ll pass on that thanks! You’ll never guess what’s on free to air right now. And we’re watching it. LOL. The original Jumanji. Channel 9. Thank you so much for the follow. I think I’ll be writing for a while now about my wanderings all those years ago. I was then about the same age as you are now presumably. I love your phrase on your about me page “pressing toward adulthood with epic resistance”. I have always found the phrase “fake it till you make it” helps one get through any number of times when you feel out of your depth. There is no age limit to studies. We are always learning something new, every single day!!! Glad to have come across your Blog!!! Bravo! You give the rest of us something to aim for. Hi – I love your blog and have nominated you for a Unique Blogger Award – thanks for all the words! Sorry – this is the link! Thank you so much. It is great to have such positive feedback. However, I don’t participate in the blogger awards. They are a great encouragement but I found they distracted me from working on my current manuscript. I do appreciate the gesture though. I am glad I happened upon your blog today. So far I find it fun and full of insight. Don’t we really keep changing all our lives…retirement is just a date set for leaving employed occupation.😊 . Thank you Miriam, and I appreciate the follow. I agree with your thoughts on retirement. It is like a second adulthood in a sense. I note you hail from Sweden. I visited a few times. My husband and I have warm memories of staying in a little seaside hideaway north of Uppsala. A magical place in the summer. I am that glad to hear you actually holidayed in Sweden. Uppsala has one of the oldest and best universities in the world. Founded in 1477. The coast is gorgeous. I hail from the coast outside Gothenburg on the West side of the country. I first went as an Australian “backpacker” in 1978 with a group. Then, independently. I ended up in a small town called Falkoping for a week, staying with a family. Lovely! Later, I had a friend who worked for many, many years for the Chamber of Commerce in Uppsala. It is when we stayed with her that my husband and I went to the holiday place. She was very cultured and loved to attend functions at the university and in the concert hall. Usually, I would cross over into Sweden on the train from Copenhagen (because I had another friend on the island of Fyn). But I have never stayed in Gothenburg or its environs. Another friend (Swedish born) is just about to return to live. She and her two children leave Australia next week and her husband to follow. She is very excited and nervous! The children are going into an international school. I can’t remember the name of the town. Hi Gwendoline. It was nice to see you found our site and allowing us to explore yours. Yes, isn’t retirement awesome. Mine was planned after 39 years and God definitely showed me that it was time to move on to other adventures. It’s gonna be fun following your travels and hearing your thoughts. It is always joy seeing and hearing through the eyes and words from others in different parts of the world. Thank you so much and I think I have now checked the correct box to receive your posts by email too. This is so kind of you to be inclined to follow our adventures Gwendoline. It is so interesting to meet new people like you and learn about their lives through their pictures and words. You have an interesting story and one we will learn from. For a brief moment in time I had an idea to hire a campervan and spend a year travelling around the States. Then I realised that would still only allow a week per state. Hardly touching what there is to see in your vast country. So I will enjoy it vicariously! You are soooo right. There is so much real estate from N to S and E to W. Each community has so much to absorb. This is why it is so nice linking with fellow travelers so we all can live vicariously. Hi, I just found your blog, it looks great. You sound like an interesting person, we have some things in common, mostly travel, and writing. One day I will write my life story, but at the moment I’ll stick to magazine writing. I took early retirement too, my husband and I bought a yacht and sailed it to Greece……. I salute a fellow baby boomer and perpetual student. I don’t know about you, but when I turned from academic writing to fiction, I had to start learning all over again… even more fun. Thank you Hilary. The uni experience came to me very late, I was already in my mid-fifties on enrolment, and yes, switching between academic and novel writing style was a challenge. Even worse though, was my thirty or so years in the shipping industry – where “less” is definitely “more” in communication. Where do you want it? When? And what are the dimensions? I would send my colleagues mad whenever I embellished with what I considered necessary facts and they just saw as too much detail. Consequently my writing often has short sentences. Something good has come out of the process though, as my first book will be in store June 30th. More nervous than excited at this point. You no doubt remember the feeling, even though you have several under your belt now! I know exactly what you mean. Short sentences are good. In academic writing it is a case of getting to B from A swiftly, precisely and without errors. In fiction you need to take people for a stroll around the garden, while distracting their attention, so they only spot the fountain in the middle at the last minute. Good luck with the publishing process. I understand the nervousness, if I could I would hand the finished book to an alter ego to deal with the publication and I would just start writing the next one. This publishing process is a long journey, and although I have an idea for another book, I find I cannot begin while I am still so involved in the run-up to book release. And I don’t suppose it gets much better straight after while the publisher is still actively pushing the promotion. Just visiting your blog quickly Gwen … lots of good stuff there and re hubby’s name BILL – good it’s double l and not one or it might be confused with BIL (Brother in Law)! I haven’t blogged since champagne so followers possibly believe I got lost there … could be worse places to get lost I guess…. hopefully will be back on stream soon … watch this space! Great to hear from you Ingrid. I have not been able to blog recently either. I am deeply buried in the final edit of my manuscript which has been notated by the publisher’s copy editor. I have to return it to them by the end of the month. This is all new territory for me, and a very interesting learning curve. Love to see how other retirees are spending their days. Unlike you I was not reluctant at all! Very entertaining introduction-enjoyed it very much. Pleased to meet you. It is a pleasure to be following your blog. My blog is mainly covering music news and providing some other musical projects I will put on my website. Please check out the latest posts I have made thus far. By the way, how is Australia? I have always wanted to go there since I am into some of the snakes that live there. Thank you for coming on board, and many apologies for the delay in commenting. I have been travelling. Your blog sounds really interesting, and I will be sure to take a good look when I am home again. Snakes? Well, that’s a nice hobby . . . but most Aussies I know try to leave them in peace. Unless you know what you are doing, you can come off second best. “My challenge now is to become ‘as one’ with the delete key on my laptop.” This made me laugh. I know exactly what you mean. Some book I read a million years ago said that cutting is the most important part of writing. Hey, I was born in 1955, too. They keep re-defining the Boomers. It wasn’t long ago that 1955 just barely qualified as a Boomer. I remember reading that definition and feeling disappointed that I was technically one of them. Now we’re right in the middle? And I never even tuned in, turned on and dropped out. I was too busy studying. Guess what? In some circles, us of the 1955 vintage are referred to as – – – shock – – – horror – – – SENIORS! Arrghhhh! Thank you. I enjoy dropping in on your blog from time to time. I have a passing interest in military history, although my knowledge is more from the Australian perspective. I did a post last year on the Catalina museum in Lake Boga NSW which might hold some interest for you. This time around, as I enter the very beginnings of WWII, I plan on becoming far more international about the Pacific War. Your perspective and opinions will be more than welcome!! Thanks for the tip, I took a quick look into that and it is quite interesting – I’ve made a note to look into it deeper when I get to 1943. Gwendoline, you look wonderful (I calculate your age :-). Good luck in your blogging. You are too kind BUT I have to confess that I am not fit :-). I was interested to note you are a personal trainer. I did have a young Russian trainer for a couple of years, and he worked me hard BUT effectively. Too bad he moved on. It is my observation that it takes at least three months of consistent hard work to get into shape, and only six weeks to lose it – LOL. Ahh – so that’s my problem! I haven’t forgotten or overlooked this comment – but I am mulling it over. We are perhaps at the same point of enquiry . . . don’t want to give any flippant reply . . . Your ‘I don’t know answer’ resonated with me. I don’t know seems to be my answer for everything these days when I ask myself where I am going! We could ascribe to the whimsical “my destiny will find me” theory? If I should live that long . . .
A thought popped in – the environment you are living in does not seem right for you. The mentality of the people surrounding you, does not seem to fit with what you have shared about yourself – so sorry If I’m speaking out of turn. Where is your life? That’s a complicated one, and you are not speaking out of turn. We are living in the lap of luxury, on the golf course and coast, in a modern apartment, and most of the neighbours are young at heart and open-minded. My comments were more about the shock of transitioning into unexpected retirement, something that I wrote about when I first started blogging last May (2013). IF I knew where else I wanted to be, then my husband would be prepared to relocate. The problem is that I don’t know, so that suggests the change is waiting within. I am going to Paris in October, to write while starving in an attic – metaphorically speaking. I will be sharing an apartment with someone I am yet to be introduced to. That should be an exciting few weeks! I meant *life* 🙂 I think our environment and the people around us affects us human beings so much! HI Gwendoline – I found your site. I have been to Wollongong too! I suppose what attracted me is you attempting to find your wife after change. Keep going! Re-inventing myself is certainly a “life experience”. I used to have a job where my opinion was valued. Organisations backed that with serious money. Then I moved to an “over 55s”, where my biggest claim to fame was being the youngest “chickie babe” in the place. Thank God I didn’t have a stable upbringing. The only thing you can guarantee in life is nothing will stay the same . . .
Hi Sandra, here I am, apologies for the delay, I have been on a travel memoir writing course. I am very honoured to review the anthology. You do know I have never done that before, don’t you? I am not a professional writer, and my blog only has around 200 followers. However, if you have faith in my opinion, then sure, I am up for it. You can send it to me as an e-book as that would be easier for you. However, I will mention that we have an on-site library here, and we have around 250 residents – so if you would like to donate a signed copy for a wider readership, then by all means mail me a hardcopy. (we can do the address off-line). Also, I just engaged an editor, and she will start working on my manuscript at the end of March, so I am marching forward with my own work too (couldn’t resist that little pun). BTW, Gwen is okay, showing my full name on the blog is me poking fun at myself. Very smooth reading, indeed. Keep writing in the same way and one day you will have “Best Seller” under your belt.. Thank you for the award Sandra. I managed to catch up with that and pass it along. Your recognition is much appreciated.